Venue: Teslim Balogun Stadium, Surulere, Lagos, Nigeria. Nigeria take on Sudan in a final leg of qualification for the 2017 Africa U20 Cup of Nations; a match which will take place today at the famous Teslim Balogun Stadium, Surulere, Lagos, Nigeria. The Flying Eagles who won the first leg 2-1 a fortnight ago in Omdurman are just a step away from qualifying for the football showpiece as a draw or win would be enough for the team. The Team in a friendly match on Wednesday were held 2-2 by Remo Star as an own goal scored by Oche Salefu and a strike from Orji Okonkwo put the Flying Eagles ahead before goals from Ekenne Awaze and Onu handed Remo Stars a share of the spoils from the encounter that saw Samuel Chukwueze missing a penalty kick. 61′ RED CARD. Walaadihh Musa has been sent off for dissent. 47′ Nigeria Substitution : Orji Okonkwo IN, Gavin Thompson OUT. 46′ Second half kicks off. 39′ Substitution for Sudan: Nasiri Bashir ON, Mohammed Osama OUT. 0′ Game On! 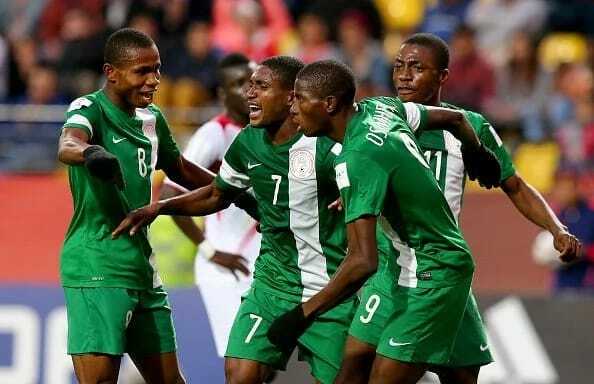 The Flying Eagles need a win or a draw to qualify.